Located in southern Brazil, the state of Santa Catarina is home to German, Italian, Portuguese, Hungarian and Polish settlements. With more than 6 million residents, unites a diversity of scenery and people. Beautiful landscapes with white sand beaches along the coast of 561 kilometers, tropical forests and snowy mountains. 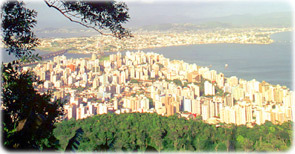 Florianópolis is the capital. Copyright © Geographic Guide South Brazil. 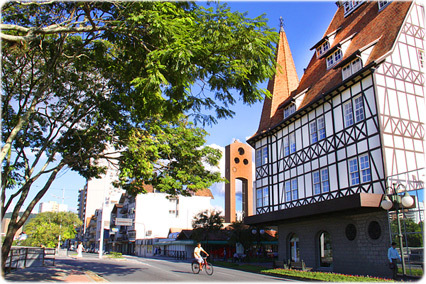 State of Santa Catarina, beaches, tourism and tourist attractions. Florianópolis as seen from Morro da Cruz. With 561 km of coast, the State of Santa Catarina, in southern Brazil, has beaches of rare natural beauty. Some of them of difficult access, but still a worthwhile visit. 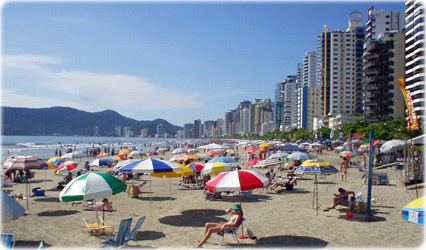 There is the beaches of Florianópolis, the capital of Santa Catarina, near the resources of a big town. There is also the wonderful beaches of Garopaba, Praia do Rosa, Guarda do Embaú (photo), Laguna, Imbituba, Balneário Camboriú, Bombinhas, São Francisco do Sul and many athers. The stunningly beautiful beaches of Guarda do Embaú, in the Santa Catarina coast, Brazil. Balneário Camboriu, a resort in southern Brazil. 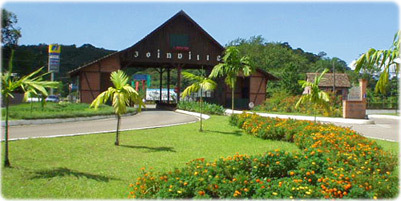 Portal of Joinville, the biggest city of Santa Catarina.